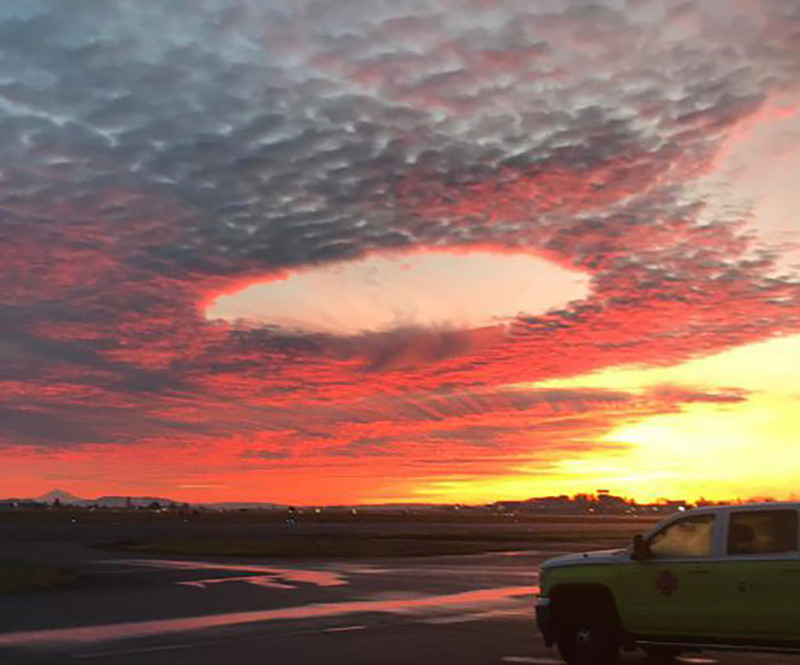 Residents of Vancouver Island were surprised to see fallstreak hole, also known as a hole-punch cloud, early Monday morning, and some had their cameras out ready to capture this phenomenon. The U.S. National Weather Service says these form when “high to mid-level clouds, such as altocumulus, composed of tiny water droplets that are much colder than freezing, but have yet to freeze.” These large numbers of tiny ice crystals, which could be formed by passing aircraft, introduced in the cloud layer sets off a domino effect of fusion, thus creating the hole. Read more for additional pictures and information. “A quirk of water and air means that water vapour condenses more readily on the ice than it did on the water. The ice crystals grow rapidly, drying the air and falling out of the cloud. This leaves a clear hole in the cloud layer with a fallstreak below it,” said scientist Ed Wiebe of the University of Victoria.